12 kilometers long with 11 loops ranging in size from 2.2 to 9 kilometers long. The Loud Creek Ski Trail is located in Oscoda County, Michigan. The nearest community is Mio, about 2 miles north. From Mio, go south to 14th Street. Take 14th Street approximately 1 mile to Cauchy Road. Go right 1 1/2 miles to parking entrance. Cross Country Ski trail is groomed. This cross-country ski trail consists of seven complete runs ranging from 2.2k to 7k round trip adventures. 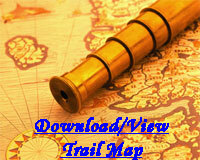 The complete trail is signed with location and difficulty rating information. With no motorized vehicles allowed, this trail is used as a ski trail, but also as a hiking trail in the summer. Easily accessible and with ample parking, the ski trail has over 10k total trail distances. The Loud Creek Ski Trail is open to the public year round. It is used for skiing in the winter and hiking in the summer. For the latest information regarding condition of the facility, contact the MIO Ranger Station at 989-826-3252. There are no fees required for the Loud Creek Ski Trail. However, donations may be made for the Loud Creek Ski Club. A "You are here" map is located at each intersection and benches are located at several trail intersections. Trail users are asked to leave no trace of their visit.